In cases where Flotron can utilize an Off-the-Shelf product as a starting point and make a few simple modifications to meet our customer’s requirements, we identify these turnover fixtures as Modified Standard. In addition to providing the rotation fixture, Flotron has the capability to design and fabricate custom tooling that interfaces directly to a customer’s payload. Flotronaerospace tooling interface hardware typically consists of a steel or aluminum weldment with simply machined pads, swing clamps, or support standoffs that conform to the payload geometry. 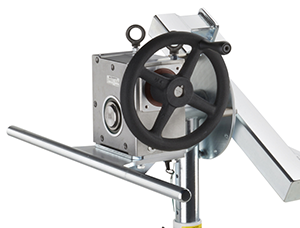 There is always a compromise between rollability and payload sensitivity when transporting your Flotron rotation fixture and one of the main considerations is the hardness of the wheel material. 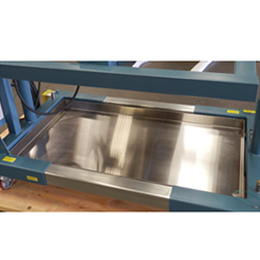 If your team is confronted with the challenge of rolling your Flotron with sensitive electronic payload integrated in a clean room, across an ESD floor, from building to building, down the sidewalk or across a parking lot, Flotron can provide an appropriate caster option. Flotron has an off-the-shelf clean room fixture finish option that includes gloss white finish, electro-less nickel plating and stainless steel in addition to Krytox lubricants. However, there are some cases where special material and process requirements apply and Flotron can provide special lubricants, removal of PVCs or Teflon, masked welds for future periodic re-inspection , etc. There are cases where payload fluid loss must be captured to avoid EH&S concerns and this is where a drip pan would be a valuable to a Flotron trunnion fixture. 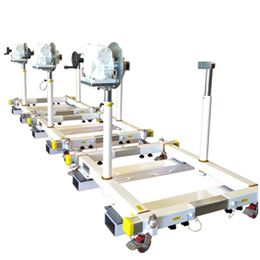 Large material handling equipment, ground support equipment, dollies, work stands,etc. 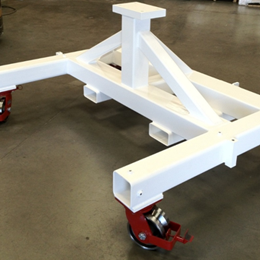 are typically towed from building to building, to and from storage, or across any considerable distance. 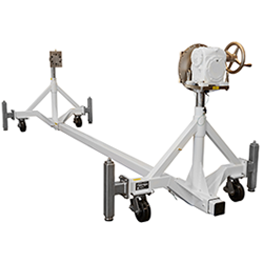 Flotron offers a tow bar feature that can be integrated onto almost all of the off-the-shelf rotation fixture product line. Flotron also offers removable forklift tubes (pockets) to ease transportation and the loading/unloading process. For applications requiring consistent transportation (e.g. 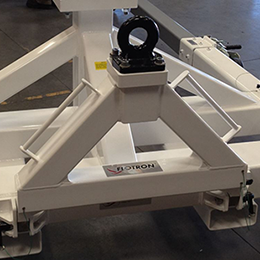 Flotron assembly lines, cell based manufacturing using Flotron assembly fixtures) a push bar improves the maneuverability and ergonomics of the rotational holding fixture.